An impressive release this, and a near miraculous one, given how rare studio recordings by symphony orchestras have become in recent years. The liner notes give little away about how MSR managed to finance the venture, and to book the London Symphony Orchestra, no less. The venture is even more surprising given the relatively unknown conductor, Lance Fridel. MSR has had a previous success with him, a disc of Nielsen with the Aarhus Orchestra (1150), but even so, his name alone is unlikely to promote sales. 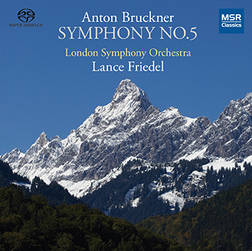 That of the London Symphony might, however, and the SACD format – a luxury that almost always rewards in Bruckner. Artistically, the gamble pays off. Friedel shows himself here to be an accomplished and distinctive Brucknerian. He comes as close as any I have heard to the Holy Grail of modern Bruckner interpretation: a performance that is fashionably fast and dynamic, yet which also retains the grandeur and depth that so many present-day conductors are happy to sacrifice. The running time of 73:19 places this among the fastest I’ve heard. Most of the time is made up in the first movement, which here runs to 18:35, against an average of 22-25. The scherzo is on the fast side as well, although the Adagio and finale are closer to the average. The opening of the first movement is slow, and the initial tuttis are suitably monumental. But when Bruckner gets busy with his thematic working, Friedel increases the tempo. On the whole it works well. Although the tempos are fast, they are a supple too, and Friedel knows how to structure the music at every level. I was sometimes frustrated by the lack of space between the phrases, which tend to run one into another. Given the generous acoustic (of All Hallows Church, Gospel Oak – what a luxury to hear the London Symphony recorded somewhere other than the dreadful Barbican Hall! ), there are many opportunities to let the sound die away before the tackling the next phrase. But that’s not Friedel’s way, he’s thinking in longer paragraphs and rarely lets the momentum drop. It’s an effective approach, although some of the tuttis later on sometimes sound a little rushed, and while he creates an appropriate sense of finality in the coda (no mean feat), the final chords of the first movement are a little lacking in gravitas. The second movement is taken at a more traditional pace, even slower than many versions in some passages. Excellent balance here, for instance with the pizzicato accompaniment to the opening oboe solo. Friedel gives the woodwind soloists ample space the phrase eloquently. He also leads the strings in some delicious phrasing as the movement develops. The scherzo is also characterized by impressive balance, especially with the brass, who provide weight but without excessive volume. At 13:31 this is a fast reading of the scherzo, but it’s power and dynamism come from carefully weighted accents and precise playing as much as from sheer speed. In the opening of the finale, Friedel recounts faithfully the various tempos of the earlier movements as their themes are reprised, still managing to integrate them effectively. The chorale, when it first appears, seems a little underpowered. But Friedel knows what he is doing, and gradually builds up from this point to the coda, adding volume, but again using increasing agogic weight and impact from the brass as much as he does sheer power to achieve the effect. All round, this is an approach that makes the most of the world-class orchestra the MSR has put at Friedel’s disposal. Sound quality is excellent, with renowned engineer Phil Rowlands giving his very best. (Just another brief plea here: please LSO, can we have some recordings from this venue on the LSO Live label.) Interpretively, the fast tempos, especially in the first movement, may be unforgivable for some, but they are not fast-fast – we’re in Günter Wand or Marcus Bosch territory here, not the super-slick world of Neeme Järvi or Thomas Dausgaard. And, in the finale, Friedel makes an excellent case for his tempo choices by integrating them all towards a compelling, and monumental, climax. All round then, an impressive Bruckner Five, certainly a contender in the work’s rapidly growing SACD discography.